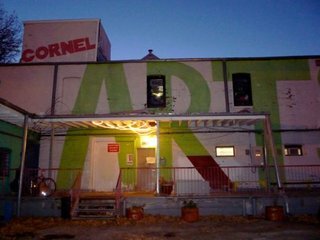 An artists' studio building since 1986, the Cornelia Arts Building provides space to over 40 local artists whose work spans disciplines including painting and drawing, sculpture, photography, print-making, jewelry design and more. Building-wide open studio events occur each October (for Chicago Artists Month) and various events and open houses are coordinated throughout the year. The Cornelia Arts Building has provided space for working artists from Chicago, across the US, and abroad to develop their work since 1986. Located in the Ravenswood/Roscoe Village neighborhoods, the building has had a vibrant history. Built in 1910 as an ice blockhouse manufacturing company, the portion that jets out from the building on the south side were stables - ice was delivered by horse-drawn carriage. Somewhere between that time and the 1970’s it became a clay factory (and a major supplier for Lillstreet Studios), the building also manufactured airplane parts, and was a pipe bending operation before it was converted to artist loft spaces in 1986. In 1987, the first neighborhoood "art walk" was held. In 1988, Friends Of The Arts (http://www.fota.com), a not-for-profit arts support group specializing in emerging art & artists, was established and located in the Cornelia Arts Building.